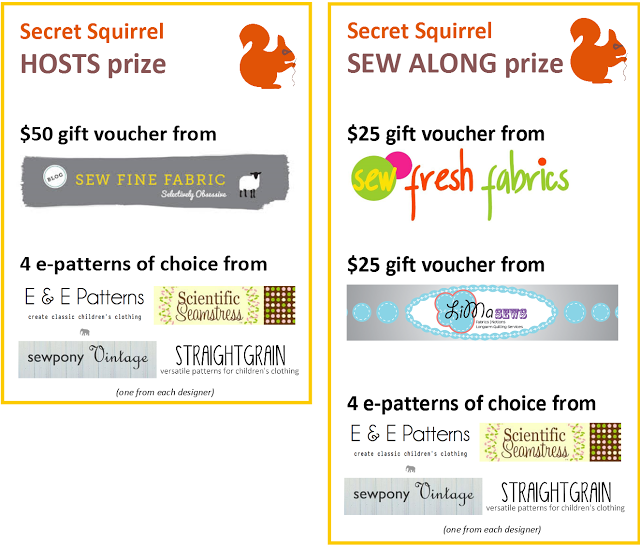 The Secret Squirrel series is a year-long sewing journey created by An from Straight-grain and Suz from Sewpony. Read all about it here. Ok that's not what really happened, but saying that I was dancing in the middle of our kitchen after receiving an e-mail from Victoria from As It Seams passing the Secret Squirrel mission on to me would have been a tiny little bit embarrassing... Oops, I just said that! I am a huge fan of Secret Squirrel and have been sewing along for a few months. Here are my previous Secret Squirrel projects. Please feel free to click on images to read corresponding posts. Where the wild things are. Blue. David Bowie. Pockets. Great Britain. In my view these were the trickiest acorns Secret Squirrel has delivered so far! However, While she was sleeping, I managed to create an outfit for Little Monkey that incorporated these acorns - all five of them! I have had so much fun sewing the Mara blouse by Compagnie M last time I had to give it another go. I made a dress version this time and I love it! Doesn't Little Monkey look so smart in it? And oh so grown up! Ding-ding! The dress is blue! Well, it is made out of denim, the most beautiful and soft denim I have ever touched. It is so incredibly light I did not believe it was denim at first, which amused the shop assistant I think. The colour is so rich! Perfect for this challenge. I bought it from House of Cloth in Bendigo. A shop well worth a visit if you are serious about fabrics you are using. I opted for butterfly sleeves again. They are such a cute shape and cover gentle skin from harsh Australian sun. Apart from being the most adorable kids book, Where the wild things are proved to be a tricky acorn! I am sewing for a girl, and the main character is a boy (although any parent of a toddler will recognise their child in little Max). In the book Max tames the wild things and becomes their king. I was not going to make a wild creature costume for Little Monkey, although she probably would have enjoyed it. Instead I used the colour of kings. What colour is that I hear someone ask? Purple. Purple is the colour of kings. I picked this lovely fabric with purple flowers on it for the yoke of the dress. Apart from being the colour of kings, purple is also Little Monkey's favourite colour. When I bought this fabric I became the best mummy on the planet right until I said no to watching cartoons at bedtime! I actually went to House of Cloth to buy this fabric for the yoke. It is Liberty fabric. Do you know much about Liberty? Liberty originated in London. I am not sure if Liberty fabrics are made in the UK nowadays, but I thought that was enough to cross Great Britain off the list. Yep. No Big Bens, double decker buses or anything else that would usually come to people's minds when they hear Great Britain. Liberty fabric is what comes to mine. What do you think about the buttons on the yoke? Aren't they gorgeous? They are vintage buttons. I also bought them from House of Cloth. I used one to make a hair clip for Little Monkey to match her new dress. Buttons is one thing Little Monkey loves. She also loves pockets. In fact everything I make for her has to have buttons or pockets. Preferably both. 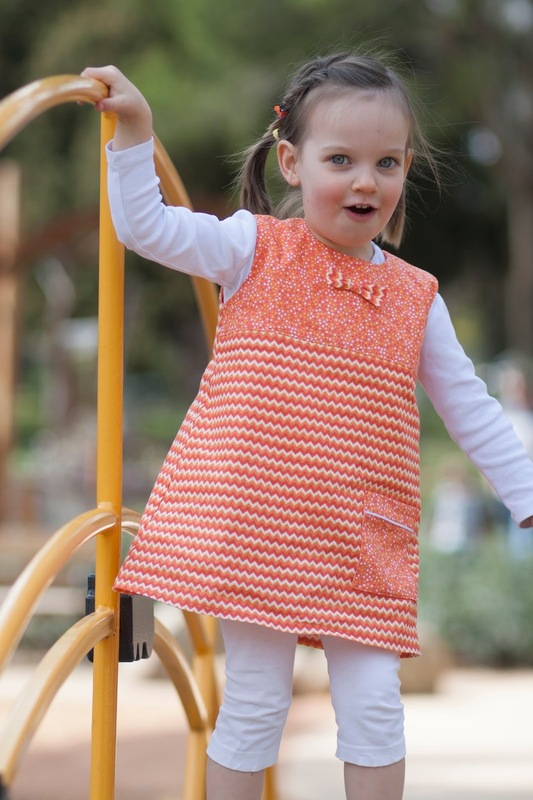 At first I made patch pockets for this dress with pin tucks on them mimicking pin tucks under the yoke, but they made the dress look too busy and took attention away from the yoke. In-seam pockets seemed like a better solution. I used this tutorial by House of Estrela to make the pockets and a trick from this tutorial by Sewaholic to make them invisible. Ta-da! Pockets! I made them out of Liberty fabric as well. I mean, why not use fabric that costs $45 a meter to make pockets no one can actually see and that will soon house cars, dinosaurs, trains, rocks, sand and any other treasures a three year old can find? But I just love the flower party going on inside Little Monkey's pockets! The last acorn left was David Bowie. I did not even know where to start! I Googled images of David Bowie, we played his music which Little Monkey did not appreciate. I even quizzed my husband! Poor husband, I think by that point he wished I was never chosen to host Secret Squirrel! David Bowie stars in the fantasy film Labyrinth. The film opens with an owl watching a teenager, Sarah, reciting lines from her favourite book called The Labyrinth. A little later on the owl transforms into Jareth, King of the Goblins, played by David Bowie. I made a Del Ray bolero by Cali Faye Collection for Little Monkey and embellished it with a funky owl (David Bowie) based on this tutorial by Me Sew Crazy. In fact, I made two Del Rays. The original bolero was too small for Little Monkey. I made another one a few sizes bigger, and it is rather roomy on her. Oops, but not an issue as Little Monkey will get plenty of wear out of it. This bolero is very stylish and can be worn with just about anything! How amazingly cool is the owl? 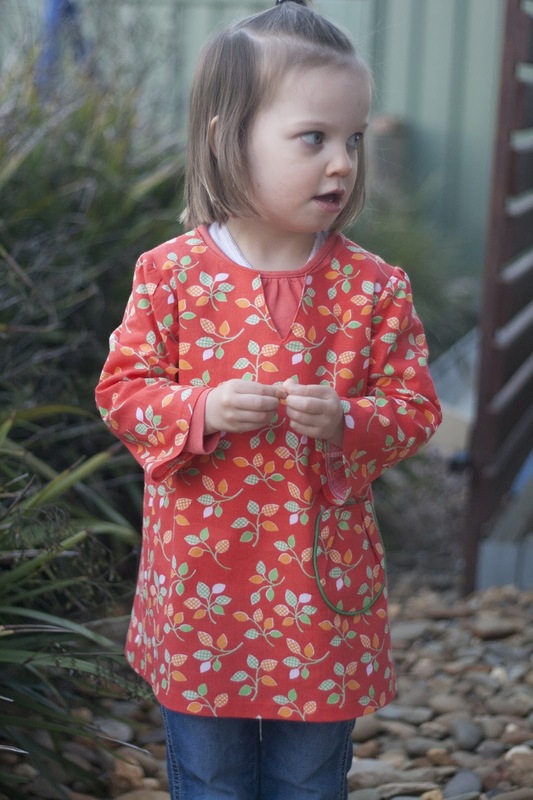 I lined Little Monkey's new bolero with cotton poplin with owls printed on it... just for fun! This was our third attempt as taking photos of Little Monkey's new outfit and she was well and truly over it by the time we finished. That's it. Five acorns of inspiration delivered by cheeky Secret Squirrel, one new outfit for my Little Monkey. St Basil's Cathedral. Snowflake. Buttons. Harry Connick Jr. A long time ago. 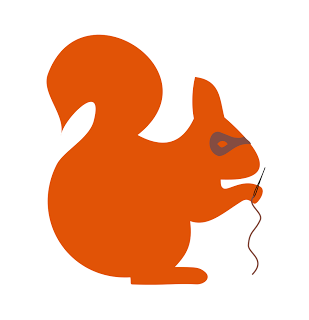 If you would like to join Secret Squirrel on his journey, leave a comment on this post and check your inbox in a week’s time… you may be the chosen one to pass on the baton of creativity that is SECRET SQUIRREL!!! If you don't receive a message form Secret Squirrel you can still sew along and share your creation in the Secret Squirrel Flickr group. But please do not blog about or upload photos for January's Secret Squirrel until January 2nd. Secret Squirrel's next stop will be revealed on January 1st! C'mon, I know you want to join the adventure! There are some amazing prizes to be won! Jenya...you did an awesome job with these acorns! Tell your husband there was no cheating at all...your five acorns make perfect sense and the outfit looks amazing! And I would love to have the secret squirrel come knocking on my door! Gorgeous Jenya:) look forward to having a better look on my computer tonight. I used to love the labyrinth! Blue is my favorite colour too. Thanks for joining in!! This turned out wonderful! I would have been lost had I been given your clues, but this turned out really great. 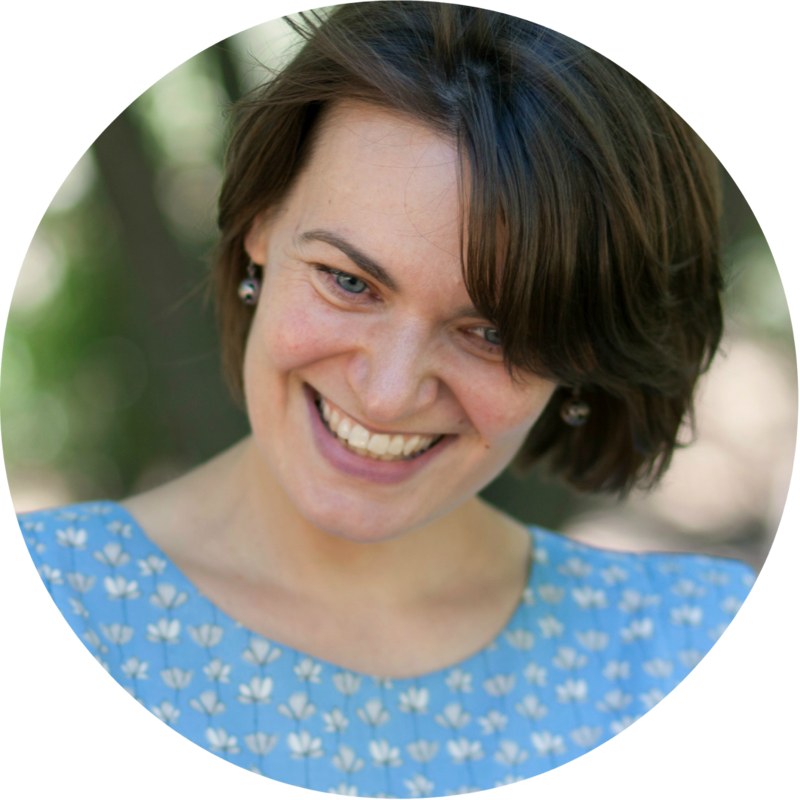 Thank you Marte :) I feel a little nervous showing designers what I have made using their patterns :) Glad you like it :) I am going to give the Louisa dress all my attention in a few minutes time. Great job Jenya! Great use of acorns. She looks darling in her outfit. I really like the acorns you shared for the next month too! You did a great job! It came together as a very cohesive look. Your embroidery is such a sweet and fun element. The denim and Liberty fabric compliment each other so well. I love how the bib is visible with the jacket on. Lovely simply, lovely. I would love for the secret squirrel to come from Australia to Utah. Adorable - I love it!! Your pictures turned out great - I never would have guessed it was a struggle! And I love the next set of acorns...great choices. Thank you Amy :) The third go at taking pics was fun and painless. Little MOnkey decided where she wanted to stand, all I have to do was to clock the camera and ask er to show me where the pockets were, or her buttons, or show me the owls on the inside of her bolero :) I am not sure if it is agains the rules to sew-along using my own acorns! oh boy, sorry about typos! This is the prettiest Mara dress I've seen so far. Brilliant! Whoops, I think I posted mine too early this go around...I'm getting my months all confused, just too much going on. I love your interpretation of the acorns. I so wanted to do Liberty fabric for my Great Britain one, but couldn't justify the cost. Glad you did though because it is so lovely! I like the owls as well...Labyrinth, of the memories. Well done indeed on your lovely and practical outfit! Your outfit is great! I will tell my husband I was not the only one who thought Liberty fabric is a good solution for that acorn! I only bought 30 cm of Liberty fabric. It is such a beautiful fabric, but is pricey! I thought the owl would take forever, but it was much easier than I expected! 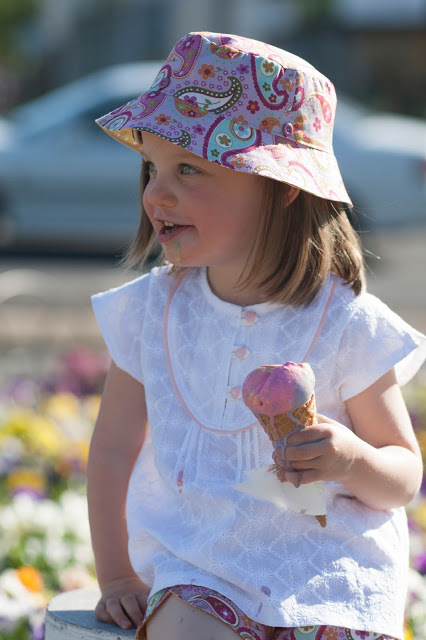 Thank you Ros :) Little Monkey wore her bolero on her daddy-daughter trip to Melbourne and refused to take it off despite the fact it was hot! Thank you Michelle :) What you said is exactly why I love this pattern - the clean look with lovely details. I wasn't going to use Liberty for pockets at first, but then I decided it was just fabric - well, very pretty and very expensive, but still only fabric. No one would get any joy out of it if it is just sitting on a shelf... The pockets might not be visible, but LM and I know about this little hidden colourful detail :) It is our little secret! Very, very clever interpretation of the 5 acorns, Jenya!!! I cannot see any evidence of cheating... all sounds very reasonable to me. I've never sewn with Liberty of London, but after seeing your gorgeous dress, I think I need some. Thank you Pam. I am now in love with Liberty. I wonder if it is ever on sale! Adorable, Jenya! I love how you incorporated the five acorns, especially the jacket. Good job!!!! Thank you Venus :) Making this outfit was a lot of fun! Great job, Jenya! I really love all the little details you made! Liberty for the pockets is super sweet. Matching hair clip is perfect addition. Love the hidden owls inside bolero! Of course I am ready to welcome Secret Squirrel to my home! I love the Mara blouse turned into a dress! The sleeves are adorable as is the contrast fabric for the pockets - love, love, love creative pockets :) I just joined the Squirrel sew along, and I am so excited by your acorns! Thanks for the inspiration! Thank you very much :) Glad you have joined Secret Squirrel :) Warning - it is highly addictive! Thank you Sherri :) After reading your post about designer fabrics I understand what you mean! Liberty is gorgeous. Too bad it is so expensive though. OMG. Is gorgeus!! I like your interpretation, so great!!! I really love it. And liberty fabrics are so pretty. Thank you Carolina. If Liberty fabrics were not so expensive I would buy them a lot. The prints are simply gorgeous! Thank you An :) This is such a fun series, I am not sure I can handle not sewing a long for a whole month! Lovely dress and fantastic pockets. What a great idea! I love it Jenya! Feel a little guilty for landing you with tricky Acorns, but you pulled it off! I love that you used Liberty fabric. I was hoping that you'd use the Great Britain Acorn to think about British textiles, not something too obvious, and you did! And really like the denim and liberty combination. Practical and pretty. And the owl and bolero...so sweet but not to literal. I think this series is all about thinking laterally and bending the rules! Not creating 'costumes'. I really like your December Acorns (Think St Basil's is so inspiring colour-wise, and so many great Harry Connick lyrics - I saw him perform once about 20 years ago!) but I really MUST NOT TAKE ANY SEWING in the next couple of weeks. I've already got a Christmas sewing project on the go, and am so busy at work/home/Christmas that today I drove to the wrong town, yes TOWN, for a meeting....that's how strung out I am! I do see acorns as inspiration - something that gets one's creative juices flowing, soemthing that triggers imagination. Imagination is such thing, it can take us anywhere! Once again, thank you for passing the challenge on to me, it's been heaps of fun! What a fun idea. I love your interpretation and think you did have a wide variety of things to incorporate. I love the owl appliqué and the pin tucks on the dress! Thank you very much :) I will have to do this string applique/embroidery/whateveritmightbecalled technique again, I love the result. Besides it was so easy it is a crime! Thank you Michelle :) We played a few of his songs here while I was doing my so called research, and I could not believe how many of his songs I knew but never realised they were his!